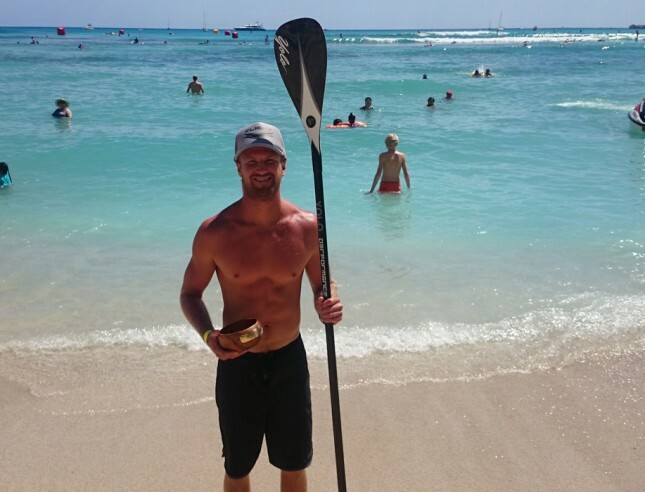 Andrew Logreco and Morgan Hoesterey have taken out today’s Hawaii Paddleboard Championships, aka the Duke Race, as part of Duke’s OceanFest here in Waikiki. With the Ultimate SUP Showdown just 24 hours away there are a whole stack of world beaters in town. Most of the pros chose to sit out today’s super hot, 9 mile downwinder from Hawaii Kai to the beach at Waikiki, however there were still a few big guns on the start line. Despite paddling a board five feet shorter than most of his rivals, it was Logreco who took out the line honours. The North Shore lifeguard, one of the true characters of stand up paddling (regularly sports a mullet and wore a Justin Bieber shirt – after losing a bet – at Molokai a couple of weeks ago) absolutely crushed it out there today. He finished nearly a minute ahead of the extremely under-rated Kaeo Abbey while also beating home unlimited masters such as Livio Menelau. The highly fancied Aussie, Jake Jensen, was third (also on a 12’6, though he was 2 minutes behind Logreco). The wind was pretty good for today’s Hawaii Kai downwinder. Not all time, but definitely some big runners in the mid part of the race. Though as we rounded Diamond Head for the final few kilometres to the finish, our angle totally shifted and suddenly it became a cross-wind grind to the line. Didn’t help that it was crazy hot today or that a few of us – yours truly included – thought we’d wing it and paddle without a water pack. The Hawaii Paddleboard Championships are one of the longest-running paddleboard races in the world, dating back to the early 90s if I’m not mistaken. And of course it’s all part of Duke’s OceanFest, an iconic event that pays homage to the great Duke Kahanamoku and promotes everything he stood for.